The pilot grant program—titled “Driving Inspiration and Innovation through Collaboration”—was initiated by SU Trustee Sam Nappi, who has provided $1.5 million for biomedical and chemical engineering to Syracuse University. Syracuse University and Upstate Medical University have announced a new pilot grant program to promote collaborative research activity between the two institutions that focuses on pressing biomedical and health care needs. The pilot grant program—titled “Driving Inspiration and Innovation through Collaboration”—was initiated by SU Trustee Sam Nappi, who has provided $1.5 million for biomedical and chemical engineering to Syracuse University. A total of $500,000 of that will fund the first phase of this collaborative research program. 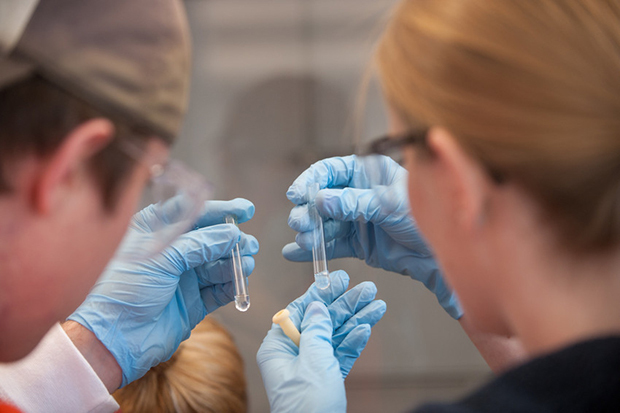 In development since last spring, the program is designed to combine the diverse research and clinical strengths of faculty from both institutions to stimulate promising biomedical or health care-related research that is responsive to national needs. The funding will support networking opportunities, matching efforts to build awareness, and pilot projects that facilitate collaborative, interdisciplinary, or translational research. Pilot grants of up to $100,000 in direct costs for up to two years’ duration will be awarded, with the bulk of awards likely to be between $50,000 and $60,000. Research teams must comprise two or more researchers or clinicians representing both campuses, and awards are expected to result in the submission of competitive proposals to external sponsors of biomedical or health care research. A two-stage review and selection process will be used, modeled after the National Institutes of Health review process but incorporating an oral presentation as used by other federal agencies. Among other criteria, proposals will be evaluated for scientific and technical merit as well as the project’s significance to and potential impact on national biomedical or health care needs. The final selections will also factor in consideration of the project’s potential to generate intellectual property or to transform the field or discipline. Final selections will be made by a research advisory panel that will include the vice presidents for research from Upstate and Syracuse universities, Sam Nappi, and two external experts. Faculty members, clinicians, or research scientists interested in applying for a seed grant should submit a letter of intent by October 16 and a full application by November 10. Final selections will be made by December 4. For more information, contact vpr@syr.edu; ambergd@upstate.edu; or furnarie@upstate.edu.